We have 60 layers (some browns, some columbians) and have been trying to come up with efficient systems to minimize the time we spend shlepping watering cans, bedding and feed. We also wanted a system where we could spend a night out on the town without worrying that a raccoon or coyote would have free access to the girls. None of what we've made is new- we simply took ideas from various books and internet sites and adapted them to meet our needs and the materials we had on hand. The result? An automatic chicken door that we can adjust according to daylight. 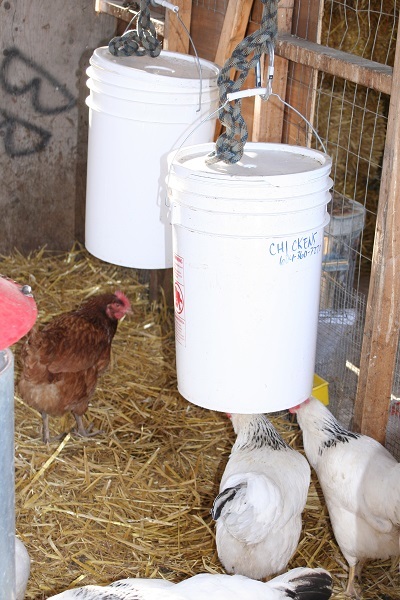 Three bucket chicken waterers that we have to fill once every 3 days, but don't ever get poopy. A roosting system with poop floors so we don't have to change the bedding as often, and we can collect pure manure for our composting system. The result? An automatic chicken door that we can adjust according to daylight.